Washington County Sheriff Mike Robinson wasn’t surprised when a bill to ban police officers from serving as school resource officers (SRO) was introduced in the Nebraska Legislature this session. Read more in the Washington County Pilot-Tribune and Enterprise. 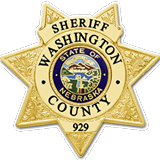 The Washington County Sheriff’s Office in Blair, Nebraska is accepting applications for the position of full-time Deputy Sheriff. Applicants must be a U.S. Citizen at least 21 years of age, have a high school diploma or GED, have a valid driver’s license, and be of good moral character with no felony or serious misdemeanor convictions. Applicants must be willing to work a rotating 12 hour schedule including weekends and holidays, and reside in Washington County within one year of appointment. Law enforcement certification is preferred, but not mandatory. If not certified, applicants must meet the requirements for admission to the Nebraska Law Enforcement Training Center. All applicants must pass an extensive background check. After the background check, applicants will be provided date of the physical assessment and written test. Benefit package includes health insurance, vacation, sick leave, retirement, take-home patrol vehicle, uniform allowance, and equipment. Washington County will pay a one-time bonus of five thousand dollars ($5,000) to the applicant hired by the County who is already a full-time Nebraska Certified Law Enforcement Officer, or who is certified through another state and able to meet the Nebraska reciprocity requirements. The bonus will be paid as follows: $2500 upon hiring and then $2500 after six months. Contact Person: Captain Shawn Thallas (402) 426-6981. Closing Date: 10/5/2018 at 4:30 p.m.
$24.5 million bond issue for new Criminal Justice Center approved! 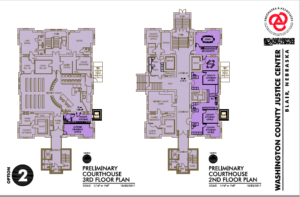 Washington County voters approved a $24.5 million bond issue for a new law enforcement and criminal justice center, which will include a 120-bed jail, a new sheriff’s office, county courtroom and expanded county attorney offices. Thank you to the citizens of Washington County! Washington County is making its case for a a $24.5 million bond issue to upgrade and add on to its current jail, law enforcement center and courthouse. A long-anticipated project to build and expand the Washington County Jail was moved forward this week when the Washington County Board of Supervisors approved pursuing a voted bond issue to finance the effort. 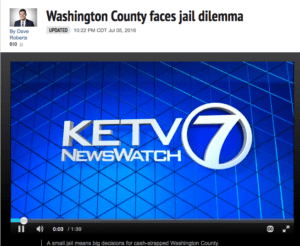 JUNE 28, 2016 — A 16-member Citizens Advisory Committee was charged by the Washington County Board of Supervisors with making a recommendation on a path moving forward in regard to the Washington County Jail. The Committee unanimously recommended that the County Board move forward with building a new “Justice Center” on a green field site with 60 beds, Sheriff’s department facility, court facilities and county attorney facilities. Take a moment to read the report from Prochaska & Associates, that addresses our jail over-crowding issue. Your support is critical in resolving this growing problem.